Pioneering post-punk band Gang of Four are set to release their brand new full-length Happy Now on April 19th, 2019. Happy Now comes 40 years after the release of the band’s groundbreaking debut Entertainment!, diving deeper into the heart of the classic Gang of Four sound with a modern slant. A combination of electronics and angular lines pursuing 21st-century grooves achieve the striking balance between the band’s fundamental sound and its restless embrace of the now and the new. Harnessing the unbridled energy of their live show, Gaoler’s melodic vocals radiate confidence while Andy GIll’s serrated guitar cuts through Thomas McNiece and Tobias Humble’s grooving rhythm section. The result is a body of anthemic songs of modern confusion, and the band’s best and most consistent work since their post-punk years. Mark Millar caught up with Andy Gill to talk about his recent illness, Happy Now and his production work. You fell ill before your final gig at the Music Hall of Williamsburg recently. How are you feeling now? AG: Yeah, but I’m not feeling 100% at the moment. I have had an ongoing chest problem for a while, that doesn’t seem too bad, but if I get an infection or a flu type thing, things can get pretty bad. I don’t think I will ever go back to America in February again – that wasn’t the smartest thing to do. There was a polar ice cap that descended over America – it was freezing and raining everywhere we went, and I got quite ill, but we struggled on. Now that I am home I have been looking after myself. We did the 6 Music festival in Liverpool recently and that all went very well. That was the first thing since we played Brooklyn and I was vaguely anxious, but I was fine, and it was great. 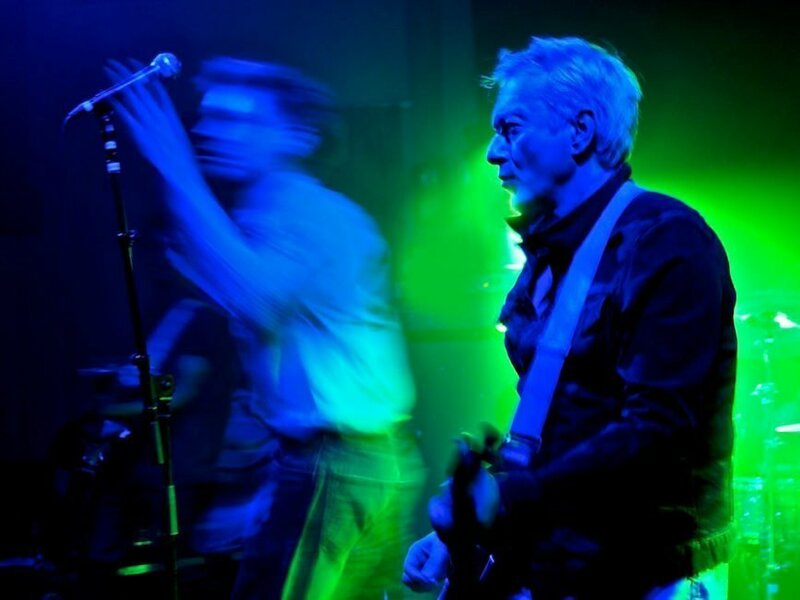 Gang of Four will release ‘Happy Now’ on April 19th. Did you go into the recording of the album with any preconceived ideas how it would sound and the kind of songs you wanted to write about? But this time it struck me that that doesn’t make sense. It’s important to have this other person say, “Why are you doing that?” Or to do things and throw things into the pot – I’m glad I did that. There were three different sets of co-producers, and all of them in their way brought something to it. And those people mixed the tracks that they worked on – I think it’s essential to have some distance between yourself and the final thing. Ben Hillier and Ross Orton were two of the producers who was the third? AG: They wear a mask, and they call themselves ‘Decoy’ and don’t want to be identified. I’m just telling you what they’ve told me. They said, “Don’t say who we are call us Decoy.” So I’m going along with their wishes. I’m desperately tempted to say who it is, but I’m sworn not to. So you didn’t feel precious or awkward at all having other producers working on your songs? AG: No, I wasn’t – I appreciated it. For some reason, I was starting very early every day. The latest I would be getting out of bed would be six in the morning, and I would get a cup of tea and go straight into the studio and either start working on the music or the melodies or lyrics. By the time anybody else turned up, I had already got a lot of work done. Then they would come in, and we would start working on it together. I found the whole process very satisfying. AG: There have been one or two funny reviews where people have said, “It’s called ‘Happy Now’ but clearly, he’s not ‘happy now.’ Who says? I might be. If there was a theme or background to the record, I suppose it’s anxiety. I’m sure it will be tempting for people to say it’s about Brexit or Donald Trump or right-wing politics in Europe. I know in a way some of those things play into it, but I think there’s a general kind of anxiety which is quite contemporary, where people worry that they are not fulfilled, or they worry about their state of mind and whether they are happy. There is a kind of a happiness industry where people try and supply things to help you figure out if you are happy and fulfilled. I think everybody has got this a bit and the general anxiety about not just themselves but the world as well. It’s the tenth Gang of Four album, and it felt in a mock-ironic way to pronounce some sort of arrival that we have arrived at the land of happiness. Initially, fans could pre-order ‘Happy Now’ via PledgeMusic. Now that they have gone under, it must be a headache for the band so near release? AG: Yeah, it’s just awful. It’s terrible for the fans and it’s awful for the Gang of Four. The production of vinyl and CDs has had to be moved and pushed back, and the money that was supposed to be doing that from PledgeMusic has disappeared. I have to say I’m not anywhere in as bad a position as some bands who are owed vast sums. Some groups are struggling to survive at all – it’s an awful situation. Nobody at this point seems to have a concrete explanation of precisely what went wrong. It was a very healthy model, so what exactly went wrong? Whatever it was has fucked up what I’ve been doing, and it made it difficult to launch this album. We are predicting right now on the release date we will have numbers in the shops, but not enough. It will probably run out pretty quickly. We have repressing going on at the moment, and we had to scramble around trying to find people to do it and get the money and all the rest of it – total headache. We have moved the whole thing to a similar model as PledgeMusic, called Townsend Music, and we have managed to get in touch with all the people who had got Gang of Four stuff from PledgeMusic and told them to get their money back and come to Townsend, and we will give you a discount. As well as releasing ‘Happy Now’ this year, ‘Entertainment’ celebrates its 40th birthday in 2019. It’s a classic album – what memories do you have of recording that record, and why do you think people still enjoy it all these years later? AG: The recording was very interesting because we were all relatively new to the process. I remember during the process of recording ‘Entertainment,’ discovering how a compressor works and what it did. There were these basic bits of studio equipment that you come across for the first time, and you start to understand what it does to the sound. We produced the album ourselves in the Old Kent Road, in a studio called the Workhouse – there was no sophisticated equipment of any kind. If we wanted any kind of short reverb, there was a toilet, and there was a speaker suspended above the toilet pointing down, and a microphone picking up the reflection from the toilet. So we’d send the vocal to the toilet, so you got this short reverb coming back, that’s how basic it was. It was a very dead sounding studio which was a bit of a 70s thing with carpet on the walls and stuff like that. The drum sound is quite dead, and it wasn’t by design – it’s just the way it was, and I think that’s good because it adds to the clarity of it. The way it sounds is a little bit rough and ready, but it’s also clear and I think that’s good. In terms of what the record means to people, I can see why people would be drawn to it at the time because it was quite radical and it very much connected. There are songs on it like ‘I Found That Essense Rare,’ which has a very standard song construction, so it’s related to pop music in a way. But on most of the album, the songs aren’t like that – the guitars, drums, bass, and the vocals are put together in a new way because I wanted to get away from that hierarchal way that a lot of bands used to record. Where the bass and drums were at the bottom of the pyramid and then above that there were keyboards and rhythm guitars, and then above that, there was lead guitar, and above that right, at the top, there was the singer. I wanted everything to sit next to each other so the drums would work around the guitar, and the bass would work around the guitar, and the drums and everything would lock together – I think what’s successful about those Gang of Four tunes is the precision in the way they are put together. 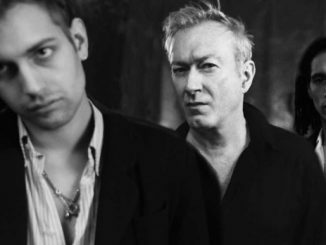 Gang of Four is celebrating the 40th anniversary of ‘Entertainment!’, with an international tour. What can fans expect? AG: After America, we were supposed to go to Japan, China, and Australia, and New Zealand, but because of what happened with the chest thing we postponed that, and we are going to go in the Autumn instead, and I’m sure we will go back to America. We will be playing stuff from ‘Happy Now,’ and either be doing all of ‘Entertainment’ or most of it. People always ask about ‘Entertainment’ but Is there an album in your back catalogue that you thought should have received more credit than it did? 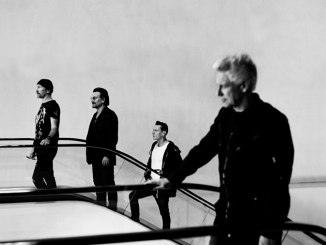 AG: Personally, and I know quite a few people share this opinion – I like the second album ‘Solid Gold.’ I think it got a very slightly darker feel, and we are pursuing a groove more steadfastly. One of my favourite albums is ‘Shrinkwrapped’ from the mid-90s – there seems to be some discussion who has the right to have that out there because it’s not available, but it needs to be. So I’m hoping we can get it released sometime — That’s possibly my favourite album. Do you get the same pleasure from your production work as you do with being a part of Gang of Four? AG: It’s quite different – I think in certain ways producing other people is slightly easier because you are responsible for everything. You are there to be a kind of film director to steer things, and to try and get the best out of people and to suggest things sound wise – I love doing that. With Gang of Four, you do those things, but you are also writing the songs, and there’s great satisfaction in doing that. What makes you say yes to a producing job? AG: There’s no one particular sound -you have to meet people and understand each other and get on to a certain extent. Every band has different challenges and sometimes its easier with the slightly older groups, and sometimes it can be a little more difficult with some of the younger bands. Merely because they maybe haven’t been exposed to how studios work. For example, when I was working with the Red Hot Chili Peppers, Anthony Kiedis, the singer, said to me “What are you doing with that microphone?” I said, “I’m putting your vocal through a compressor.” And he started complaining saying, “I want my vocal bigger, not smaller, don’t compress it.” I explained to Anthony that the effect of using the compressor would make his voice sound bigger. But he wasn’t having it – he was convinced the compressor was going to make his vocal smaller. It’s one of those things where experience in the studio can create hiccups and potentially arguments and stuff like that. There has to be something interesting about the music – it doesn’t have to be completely and radically brand new. Of everything I have done you can see, there is a wide variety of stuff. When I worked with Michael Hutchence, I was also co-writing with him. 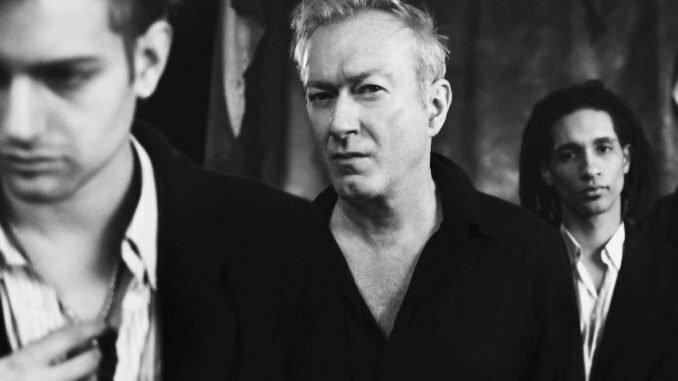 It was almost like working with Gang of Four where I was writing songs, and coming up with all the music, and then producing it with Danny Saber, and that’s extremely satisfying because you are involved in the whole process. How did you get involved with the Michael Hutchence solo record? I worked with him for a whole summer writing songs. I would programme some drums; I played bass, the guitar and some keyboards and Michael would sing on it. Sometime I would jump in on the lyrics a bit, and we ended up with a whole bunch of songs. We were both enjoying the Black Grape record, ‘It’s Great When You’re Straight…Yeah,’ a lot. 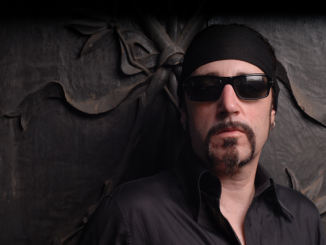 And we thought, “Let’s get another producer in, and this guy Danny Saber who produced that record is good. The record is cool.” A lot of the sound of the Black Grape record is Danny Saber. How complete was the album before Michael passed away? AG: It was 90% complete, then it sat there because Michael died and because he had paid for everything himself, and there was no record company involved at that point – there became a ridiculous situation about who owns what from the estate. It was a long time before the label V2 got involved, and asked Danny and me to finish the album. The V2 label A & R guy fixated on the song called ‘Slide Away.’ He came back to me and said, “You have got to finish this; it is an incredible song.” I said, “Okay but the problem is there is very little vocal from Michael on it – he sings the chorus brilliantly, but there’s not very much on the verses.” So I asked Bono if he would be prepared to sing on it – he listened to it and said yes he would. Bono came to my studio and wrote some lines of the song himself, and I completely rewrote the song with a whole new middle section, and we ended up with a duet. It was a bit like Bono and I saying goodbye to Michael – it is one of the standout tracks on the record.